Cybercrime is constantly on the rise, ranging from email scams and phishing to identity theft and ransomware––all of which is planned by major crime organizations. The years 2013-2017 alone reported over 9 billion data records that were lost or stolen, of which nearly 61% was due to a malicious outside cyber-attack and 13% due to a malicious insider attack. This increase in the prevalence of cybercrime attacks on business organizations, government infrastructures, and individuals has emphasized the importance of cyber security. Due to the rise in cybercrime, and our reliance on the digital world, the demand for a cybersecurity workforce is expected to rise over the next few years, leading to 1.8 million unfilled cybersecurity jobs by 2022. Choosing a career path (a decision that impacts your whole future) is not an easy choice and no one can make that decision for you. However, here are a few important pointers to help you make the right decision. Here are a few reasons why you should pursue cybersecurity as a profession. Cybersecurity is an evolving professional field that has a consistent need for advanced professionals to ensure the safety of cyberspace. There has been over a 100% rise in cybersecurity vacancies in the UK alone, placing it in the “Top 5 Jobs in Demand in the UK”; it continues to rise at a steady pace. On the whole, cybersecurity analysts are expected to see a 37% growth in the job market globally. Apart from the fact that there are 1 million job openings in the global cybersecurity workforce, it is important to remember that a cybersecurity expert deals with more than just cables and wires in the basement. Cybersecurity professional job openings range from entry-level personnel to CEOs of a company. There is also a wide variety of skills that you can pursue and specialize in. It is also important to remember that cybersecurity experts are required in just about ANY field that you can imagine––banking, hospitality, government, corporate, education, and many more. However, keep in mind that all companies are searching for Qualified Cybersecurity Professionals; thus having a certification or degree in cybersecurity will definitely work to your advantage. Cybersecurity as a profession does not deal with just one segment, but branches out into various fields like ethical hacking, digital forensics, penetration testing, information security, social engineering, and many more––much like how a doctor can specialize in neurology or cardiology. These specializations provide security through various forms, each as important as the next, resulting in all-around job satisfaction. As mentioned earlier, the unemployment level in the cybersecurity field is zero. This is a clear indication that the demand level is higher than supply, which only leads to a major rise in the price level (in this case, a rise in income). 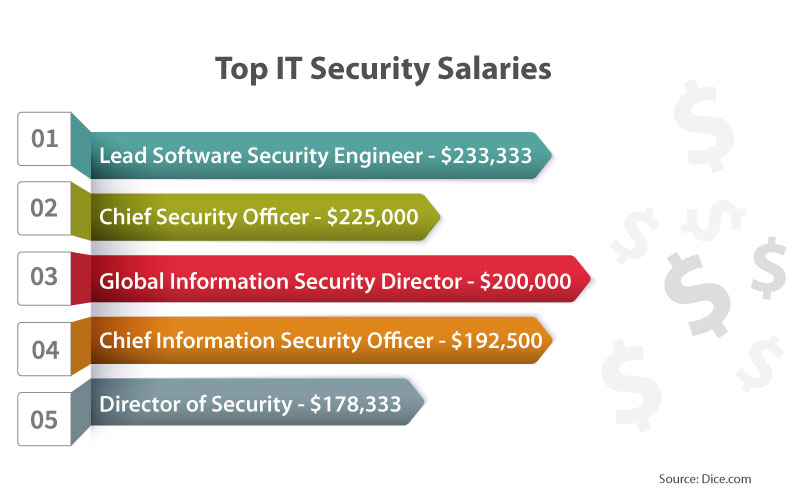 The current pay scale of a Cybersecurity Engineer in the U.S. is an average salary of over $90,000 per year*. Due to the lack of qualified cybersecurity professionals, it is estimated to rise in the years to come. On the bright side, possessing a few cybersecurity skills––such as coding, understanding web applications and system administration, or the knack to detect a cyber intrusion––could be a sign that you should consider working in the cybersecurity field. You have an eye for detail – This will help you read and analyze data with ease. You love a challenge – New threats appear every day, resulting in a very challenging atmosphere. You are organized – Security professionals must be extremely methodological. You are curious – Curiosity to explore and learn new things shows your personal interest in the field, ensuring that you can achieve great job satisfaction. With a large skill gap in the cybersecurity field, it is the perfect time to jump-start your career by choosing a profession that is sure to provide you with immense opportunities. *The salaries depicted, are taken from various sources (mentioned below). Salaries and employment status may differ from country to country and state to state. Individual research is deeply encouraged. PreviousPrevious post:EC-Council Lights the Flame of a Cyber Safe Tomorrow with TEK-UP University in TunisiaNextNext post:A Degree in Cybersecurity or a Certification Course: Which is Better for Your Future?